KoopaTV: Sonic Forces: Custom Hero — Brilliant, or Disaster? I have absolutely no faith in SEGA's ability to balance the different character types. They probably won't be balanced, and most of those abilities have no actual connection to the species. Hell, I don't even know what “Collects rings when getting damaged” means, and Rabbit is going to be used for speed-running and invulnerability exploits. ...I guess if you look at it indirectly, then that ability being Rabbit's makes sense? Cat is much better than the other ring-related abilities. Perhaps Dog having five rings after they die references Hillary Clinton starting the 2016 Democratic Party presidential primaries with a bunch of superdelegates after getting a game over in the 2008 Democratic Party presidential primaries? Left: With the pink flowers headgear, you can make Shaymin the Hedgehog! 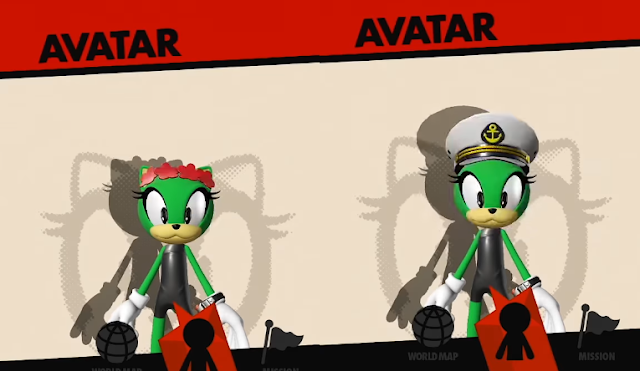 Right: With the captain's hat headgear, you can make Captain Vul the Bird! Custom characters are partly responsible for why the Fire Emblem series is an unenjoyable mess right now. (Oh, yeah, Fire Emblem Echoes: Shadows of Valencia is released tomorrow, and there's no custom character in it. Maybe I should get it?) These monsters aren't good news. ...That is, for story-based games. The Sonic the Hedgehog series, for better or for worse, has turned into a story-driven franchise. We don't know about Sonic Forces specifically, however. Would many of the downsides of having custom heroes be there (besides almost-guaranteed bad game balancing)? Still, consider the non-artistic upside: Even if custom character creation enables the worst of the franchise's fans, a lot of those fans have money to spare. SEGA isn't the most financially successful company out there, so this could be the cash-grabber they've needed. It's inclusive of all furries, whether they be your run-of-the-mill fursuiter, neo-Nazi furries, or Miiverse superstar celebrity Queen Phantasma. Additionally, this continues the Sonic the Hedgehog franchise copying off the Dragon Ball franchise. From Super Sonic copying off of going Super Saiyan, to Sonic, Shadow, and Silver being Goku, Vegeta, and Trunks, there's a long history of this copying. Dragon Ball Xenoverse introduced character creation, so it's no wonder that that'd be copied as well. It's popular for that franchise, so why not do it for the franchise that has the already biggest-existing reputation for fan character creation? 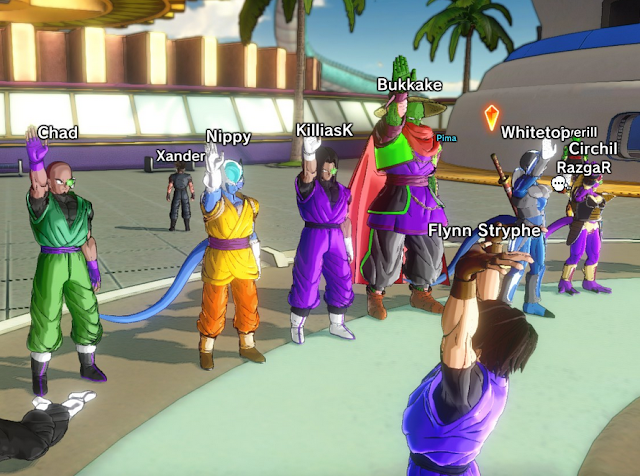 Dragon Ball Xenoverse supports neo-Nazi gatherings in online mode with custom characters. Hopefully, Sonic Forces doesn't go that far, but will still allow people to be a neo-Nazi within the confines of their own home. And only there. To my knowledge, there's no online mode in Sonic Forces (unlike Dragon Ball Xenoverse), so whatever crazy fetish concoction that could be made is exclusive to your game (and whomever watches you play it, if you're some kind of streaming phenom or YouTuber). You do you, and give SEGA all your money so they can live another year. Who am I to say no to that? Actually, Ludwig WILL be saying no to it, but only for himself, as he has absolutely no plans to ever play Sonic Forces. It's not just because there's no reptile representation, either, but he's not a fan of Sonic games in general and can't think of a current reason why he'd personally care if SEGA survives as a company. This may be the first (and as of now, only) Sonic the Hedgehog dedicated article on KoopaTV. Only took 1,068 of them! Compare Ludwig's relative tolerance of SEGA acquiescing to furries to his very negative reaction to people demanding that Nintendo include homosexuality into Tomodachi Life. There's not much difference between this and using your Mii in games, except this appears to be much more robust than Mii-making. Sure, let's talk about Fire Emblem Echoes: Shadows of Valencia. Sonic at least gets half of this article dedicated to him, about another Sonic game out before Sonic Forces. Yah, I kind of see some probably cringe-worthy things coming from this soon. Miiverse drawings were ripe with the fan "O.C.s" in the Sonic community already... and the Smash Bros. one too (let's not talk about that) but without a Miiverse functionality on the Switch, it should bring the yuck factor down a little bit. Actually, I was a little sad that Sega went down the way it did. Do you remember that long hot blooded rivalry it had with Nintendo? It all kind of ended with a whimper and a light thump for Sega. Oh well. It's worth mentioning that so far, all of the other flagship Mascots from other game companies that directly challenged Nintendo's sleeping dragon-like superiority now have their mascots appearing either as little cameos in Nintendo games, or as a second rate game port on a Nintendo system. Sonic appearing in smash and olympic games alongside pasta breath and his sweaty sidekick, Crash bandicoot in his own little dumbed down Kart racer... did you ever see those early commercials of Crash standing outside of Nintendo with a microphone, and he was all like "Rawr! I'm gonna get you hat head!" It's sort of sad how they all eventually end up, but this Sonic game is maybe the saddest. No, now even Sega's only real Mascot is taking a back seat not to a plumber, but to a deviantart inspired "O.C." I wonder if you can make a purple and pregnant Sonic? Right, the only other way to share this if you're not putting stuff on YouTube is via screenshot capture and sharing on social media, and I can choose whether or not to follow that stuff/people who would share those stuff. You have to seek that crap out. If it was online-capable, then it seeks out YOU, which is bad for cringe. But there's nothing wrong with letting cringe hang out in its own corner of the world that I need to go out of my way to locate in order to see it. Right, that hot-blooded rivalry is why I'm not a Sonic fan, 'cause obviously I was on Nintendo's side! ...And I hate that Sonic is in two Smash games to begin with, mainly because he has a horrible play style that is the worst to play against and not fun to play with. To be fair, there will be TWO Sonics to one "original character", so if they act up, then hopefully two Sonics can handle 'em. People who became Koopaling fans only after New Super Mario Bros. Wii came out. I could not care less about customizable characters as do many consumers outside of the Sonic fandom. Most are just hoping that Sonic Forces plays like Sonic Generations. ...yeah it probably will be a less-polished version of that.